Today, podcasts are a perfect example of a fast-growing, under-utilized technology which can benefit your business. Unless you’ve been living in the dark ages, podcasts are on fire—again. This on-again, off-again digital communications medium was recently named one of the most B2B consumed content formats by Demand Gen Report’s 2018 Content Preferences Survey. In fact, this study discovered 64 percent of respondents found podcasts to be a “valuable content format in the early stage of the buying journey.” From a consumer perspective, 26 percent of Americans listen to podcasts monthly, and podcast consumption among women increased by 14 percent since 2017, according to Edison Research’s The Infinite Dial 2018 report. These are impressive statistics, and if you’re a business leader or manager without a podcast game, now may be the time to create your own playbook. Today, podcasts are a perfect example of a fast-growing, under-utilized technology which can benefit your business. A podcast is similar to radio, but the audio can be streamed from or downloaded to devices such as phones or computers. Generally, consumers are able to subscribe to a podcast series they like. Then, their podcast application notifies them directly when a new episode appears. Thanks to the advent of the smartphone in the mid-2000s, podcasts have come a long way since their humble beginnings, and consumers increasingly use them for all sorts of diverse content. In 2014, the Washington Post reported one billion consumers subscribed to podcasts on iTunes alone. This number is rising and rising fast. What’s more, consumers who use podcasts use them with enormous dedication. A recent Edison Research study concluded that podcast users spend on average 25 percent of their total audio time listening to podcasts, making them significantly more tuned in than consumers of other media formats. Businesses and entrepreneurs can and should take steps to set up podcasts, but they need to be prepared with the right equipment and aware of potential problems to avoid. An observer may initially be surprised at the popularity of podcasts. After all, wouldn’t people be more inclined to tune into a video or read content rather than listen to it? However, it becomes clear to those who look that podcasts offer enormous advantages to both entrepreneurs and consumers over those alternative media formats. To entrepreneurs, podcasting provides a very cost-effective way of building relationships with an audience. To consumers, podcasts are versatile and can be used during times they can’t focus attention on an email or a video. They can turn them on when they are driving to work, when they are cooking in their kitchen or even while working in the office (should their position allow it). Like a video, audiences engage themselves with the podcaster’s voice and foster a more personal relationship with the speaker. Podcasting also offers your firm advantages over just sending an email or a newsletter and calling it a day. Written content is an invaluable aspect of a business’ marketing strategy, but not all consumers have the desire to read it routinely. They may be more engaged with a podcast where someone speaks directly to them in a more colloquial style. Podcasts do more than just provide consumers with another option and entrepreneurs with an inexpensive means of outreach. They also build relationships between the two parties. Entrepreneurs who make use of podcasts can hone their messages and tailor them perfectly to fit the needs of their listening audience. Audiences can, in turn, keep themselves up-to-date with information directly provided from the business they enjoy following. Whether a business is providing their audience with a podcast about real estate, newly-released books or even a subject like fishing, the format allows them to communicate in a way that builds their brand. For real estate-related content, podcasts are rising in popularity to demonstrate expertise in the industry. A quick glance through PlayerFM’s home page previews a number of podcasts and topics, ranging from investing to marketing to coaching to rental income. 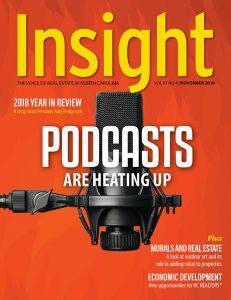 Real estate industry experts utilize podcasts to educate and inform their stakeholders, persuade consumers, and sell their service—whatever side of the industry they’re on. In fact, 64 percent of consumers prefer podcasts at the top of the sales funnel, according to the 2018 Content Preferences Survey Report. Whatever the subject, a regular stream of podcasting content keeps your audience engaged and ensures they stay tuned in to your business. As Steve and Nicole Arnold, the creators of the podcasts “Great Contemporaries” and “Abstract Art by Nicole,” state, “podcasting enables entrepreneurs to craft a message directed exclusively to their audience.” Podcasting cuts out this middle-man, so to speak, and gives you the chance to communicate to your audience in any way that you want. Though this provides entrepreneurs with enormous control over their content, they must never take their audience for granted. To really build your brand and connect with your audience, you need to keep them invested by talking about things they want to hear about. Podcasts should focus on a consistent theme while avoiding repetition and, perhaps most importantly, relate a brand to the audience’s daily life. One of the most advantageous aspects of podcasts relative to other formats for consumer outreach is how simple and cheap they are to set up. Anyone who is willing to set one up can do so. Whereas videos often require green screens, a cameraman and sometimes a move to a different area, podcasts really only demand that you buy a microphone and have access to a computer. Virtually all podcast owners agree, though, that the microphone needs to be high-quality. Muffled audio or background crackling detracts from your audience’s immersion and may even make it annoying for them to listen. Fortunately, high-caliber microphones don’t have to break your bank account. Some of the best options, recommended by seasoned podcaster Albert Costill, can be obtained for less than one hundred dollars, such as the Samson Meteor and MXL990. Once you’ve bought the microphone that you need for a great recording, you simply need to connect it to your computer and start recording. After you’ve obtained the audio file, you should visit an audio hosting site such as Libsyn (Liberated Syndication) or SoundCloud in order to upload it to the internet. Once that has been accomplished, you can post your podcast to your website and start to promote it. It may be smart to make the podcast available on streaming services like iTunes. Not only will it publicize your podcast, but it’ll also make it easier for your audience to listen and subscribe to it. As with any undertaking, prospective podcast hosts need to be aware of the potential problems that could hinder their mission. One of the most common issues that people have, when they begin a podcast, involves a lack of preparedness. Just one podcast takes a considerable amount of time to make sure that it is ready. After all, even if you do not write a full script, you will want at least a basic roadmap of your plan for the program. Questions such as: “What are you going to say to the audience?” and “How can I relate my brand and mission to their life?” should be answered in advance of the recording. Should you fail to take sufficient time beforehand to plan your podcast, you run the risk of having to record the whole thing over again or, even worse, having to make due with an impotent podcast that incites users to tune out. Not only do you have to think about the things you want to say in advance of an individual podcast, but you also need to have an overarching vision and keep to a schedule for your podcast program. All too often, hosts begin a new podcast series with only about two or three episode ideas in mind. Once those have been completed, they have to rush to come up with something to have it uploaded on schedule, or they would have to delay their next episode. If you don’t have a steady stream of content coming out of your podcast series, then viewers will lose interest in following you. Mapping out a good plan for your episodes and series will advance your brand by keeping it interesting and in the minds of viewers. Podcasts offer numerous advantages to both consumers and businesses which need to be utilized. This up-and-coming media format offers a rich platform in which consumers may engage the topics that are deeply important to them. Not only do consumers benefit from the vast assortment of podcasts, though. Businesses have the extraordinary opportunity of communicating directly with the consumers whom they value so much, and they can build their relationship with routine communication. Despite the surprisingly low cost that goes into setting up a high-quality podcast, the format offers an enormous amount of versatility compared to more traditional means of consumer-outreach. However, anyone who sets out to create a podcast should be aware that it is not something to take lightly. The experience is rewarding, but it mandates attention and care so that you can provide the best possible information to your audience on the most consistent schedule. Should you or your firm choose to take this step forward and set up an effective podcast, both your business and your consumers will surely find it to be valuable.